Today I officially re-enter the employed workers of America! I’m so excited! After being a stay at home mom for nearly 12 years, I’m definitely ready and willing to work outside of my home. Granted I had jobs here and there, none of which lasted too long. I found it difficult to work outside of my home when my kiddos needs were so strong. But now, I’m ready! 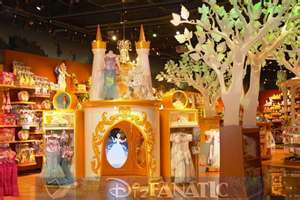 A look inside the new Disney Store. My new “job” won’t really feel like work to me, though. I’m going back to my Disney roots and working as a Cast Member at the brand new store here in the Seattle area. For those of you that don’t know, I met my husband while working at the Disney Store 15 years ago. We got married in Disneyland. We vacation there about once a year. To me, Disney is fun, not work. I’m just lucky enough to get paid to have fun! After being at home with 6 kids all summer, I definitely feel the desire to temporarily leave Mommy duties behind. Now, here I go!